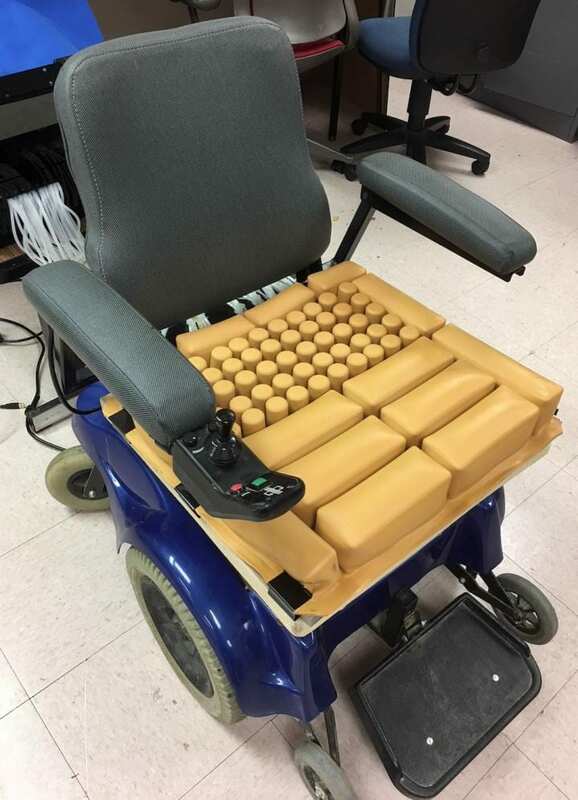 The University of Texas at Arlington has patented a smart seat cushion that uses changes in air pressure to redistribute body weight and help prevent the painful ulcers caused by sitting for long periods of time in a wheelchair. oor prosthetic fit can cause skin damage and create sores in the residual limb of the wearer. "Pressure ulcers caused by long periods of sitting without relieving pressure at boney regions such as the tailbone, frequently occur in people who spend significant amount of time on wheelchairs. In the case of prosthesis users, poor fitting of the prosthesis leads to pressure injuries for amputees that can severely affect their daily life," said Muthu Wijesundara, co-inventor of the technology and chief research scientist at UTA's Research Institute or UTARI. "Our technology improves on existing solutions by including real-time pressure monitoring and automated pressure modulation capabilities to help combat the formation of pressure ulcers or sores." The researchers recently presented the results of their studies on a full-sized seat cushion prototype at the ASME 2018 International Design Engineering Technical Conferences & Computers and Information in Engineering Conference held August 26-29, 2018 in Quebec City, Canada. When a person sits on the cushion, a network of sensors generates a pressure map and identifies vulnerable areas where pressure relief is needed. Automated pressure modulation uses this data to reconfigure the seat cushion surface to offload and redistribute pressure from sensitive areas. Additionally, the seat cushion periodically changes the pressure profile to eliminate pressure buildup over time. The researchers demonstrated the effectiveness of the technology using healthy volunteers with different weights who assumed different positions: leaning forward, backward, to the left or right. In all cases, the seat cushion measured the pressure immediately and automatically performed an effective pressure redistribution to offload pressure from sensitive areas. "This technology has multitude of applications in biomedical fields," Wijesundara said. "We really feel that it shows great promise in helping patients and their caregivers avoid the pain of stress ulcers and sores." Mickey McCabe, director of UTARI, congratulated the UTA team on the recent patent issue. "UTA's Research Institute has the mission of taking inventions out of the lab and making them useful to society," McCabe said. "This patented technology will do precisely that, helping patients avoid added trauma and reducing the burden of costs associated with ulcers and sores on the healthcare system. A real win-win for all sides."